Apple dished out all the details on its third-generation iPad during the device’s unveiling but the next iPad also raised a number of interesting questions that have yet to be answered. We know that Apple's latest iPad features a brand new Retina Display with 2048-by-1536 resolution at 264 pixels per inch. The device is powered by a dual-core A5X chip, a 5-megapixel iSight camera with 1080p video capture, a FaceTime camera for video chat, optional LTE wireless broadband, and speech-to-text dictation. Beyond the usual headlines, however, questions are being raised about whether Apple's dependence on Google Maps is coming to an end. Why no iPad 3 moniker? How much RAM is under the new iPad's hood? Is this the end of the road for iPad 1? And what does the A5X chip tell us about the next iPhone? It looks like Apple may be trying to slowly wean itself off Google services by using its own mapping products in at least part of the new iPhoto for iOS. Critics started noticing that maps in iPhoto features such as Places (photo geotagging), the Photo Journals feature, and slideshows did not have the usual look and feel of Google Maps. Whether Apple is using Google Maps at all in iPhoto is still under debate. Daring Fireball's John Gruber says sources are telling him that Google Maps are still in use for Places, but other parts of iOS use Apple's own mapping solution. Apple in 2009 bought mapping company Placebase and in 2011 bought C3 Technologies, a 3D mapping company. Apple has reportedly had a strained relationship with Google since the search giant rolled out its Android smartphone platform. Talk has been circulating for some time about Apple replacing Google services with its own versions or a rival's. Before Apple launched its new device, critics and Apple watchers were debating whether the next iPad would be dubbed iPad 3 or iPad HD. It turns out neither guess was correct and Apple is opting to simply call its tablet "iPad" from here on out. Apple does something similar for its MacBook and iMac lineup, and perhaps that similarity is significant. The iPad is already being used by some people as a laptop replacement and this newest iPad may have the speed and improved graphics that convinces the average non-geeky user to jettison a laptop for Apple's tablet. Apple's new iPad may have 1GB RAM, double the amount of the iPad 2, according to sources who spoke with The Verge. Given that the iPad has improved graphics, a better camera, and other improved features, it would not be a surprise if The Verge's claims turn out to be accurate. Apple has also doubled the RAM in each successive iPad so far, starting with 256MB RAM in the original iPad. Beginning of the end for the original iPad? If you're going to have an improved display on your tablet, you'd better come out with a new app to show off how great that new display really is. 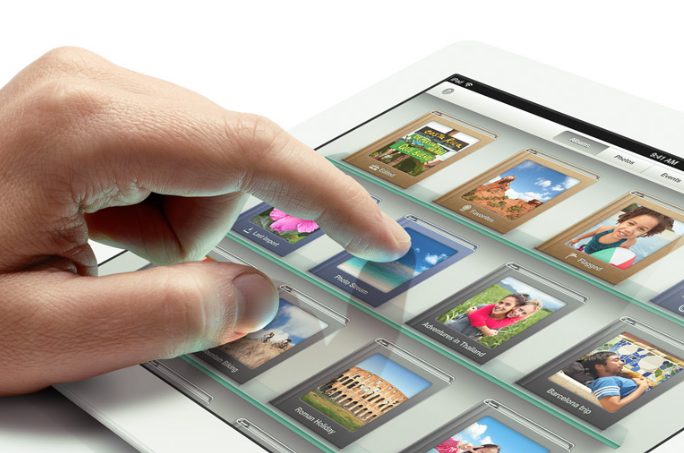 Apple chose to show off the new iPad's Retina Display by coming out with iPhoto for iOS. The new app lets you enhance colors, add effects, and remove red eye. The downside of iPhoto is that it is only available for iPad 2 and up, signaling what will likely be a gradual descent into obsolescence for Apple's first iPad. The new iPad has a brand new dual-core chip called the A5X able to produce what Apple describes as "quad-core graphics." But analysts are wondering what the A5X means for the next iPhone. There is some talk that the next iPhone will not get the A5X, but will instead sport a new quad-core chip. Since the first iPad came out with the A4 chip, Apple has introduced a new processor with the iPad and then rolled out the same chip in the iPhone. But that may not happen this time around. "I think that this new chip is probably just for the iPad," Linley Gwennap, founder and principal analyst for the Lynley Group told IDG News. We should find out what the next iPhone has in store for users later in 2012.